Last year we announced that we were working with renowned designer Ted Mayer, best known for his work for Mattel (Intellivision II and III, He-Man toys) and the original Star Wars movie. Ted has been helping us with a number of designs, including the OMNI and accessories. One such accessory is the OMNI controller. 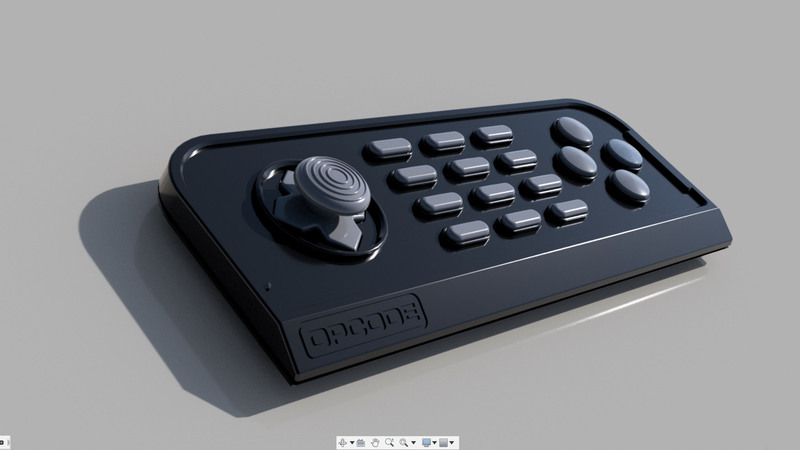 Before OMNI is released, we plan to offer a ColecoVision compatible version of the OMNI controller, which we are calling the Super Game Controller. The Super Game Controller is fully compatible with the regular ColecoVision controller, including a numeric keypad, and adds two extra buttons, for SGM2 games. The Super Game Controller also allows the use of special game overlays, and we plan to offer a complete set of them for both legacy and new games. We hope to finally offer a complete, high-quality, and viable alternative for the dreadful Coleco controllers. We are now in the process of investigating the costs involved, but so far it looks promising. We have all the sources in place. That said, our goal is to find out if there is enough interest in this project to make it happen. Since we are still investigating costs, it is hard to give precise numbers for minimum orders and final price just yet, but we are estimating 400 units and $60 per controller. We would also prefer to sell them in packs of two controllers. Please keep in mind the price is a guesstimate at this point. 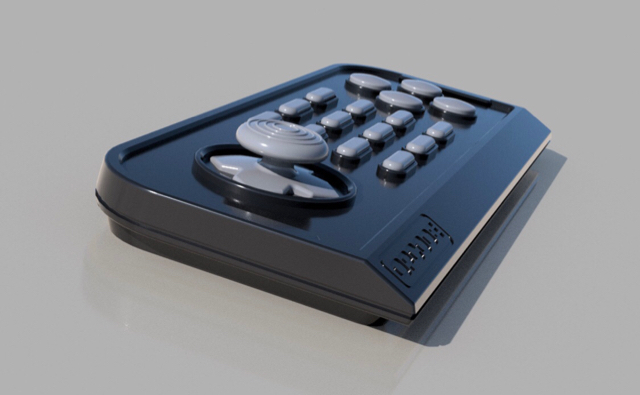 It is our best interest to sell the controller at the lowest possible price point, at no profit (for many different reasons, one being this is also our OMNI controller). UPDATE (4/1/2019): we have crossed the 200 controllers mark already. Thank you! I would say very very promising, so let's get this done! UPDATE (4/2/2019): we are past 270 controllers. Thank you again! The more orders we get, the lower the price goes. UPDATE (4/2/2019): we are past 300 controllers! Amazing. Definitively happening! Looks cool. As always, consumers want more, so I'll get this question out of the way "Do the internals allow for compatibility with Atari 2600, 7800, SMS, or Genesis?" Very nice Eduardo, I subscribed to the wait list as requested. I very much like the design - the horizontal pad is why I picked up a pair of Atari 7800 control pads for my Coleco a few years back so I like the similarity to it and the Super Famicon NTT pad. 2 suggestions: 1) keep the black / grey color scheme of the original Coleco, color match if possible and 2) if possible, depending on their size, make them storable in the existing ColcoVision controller area. I remember one of the 3rd party Coleco controllers had an "adapter" that let you fit it in the existing controller well on the ColecoVision. I forget which brand it was, but it was black with a red joystick, red buttons, and the keypad was at the top (I think they also made one in Adam colors). I guess yes, I don't see why that can't be possible, but of course the keypad would be useless. Yes, we will make sure we match the CV colors, after all this is for the CV. As for size, if I remember correctly, it is about 2 1/2 x 5 1/2 ", so a little smaller than CV controllers, so they should fit. 350 controllers and counting. Thank you so much for such an overwhelming support. We are now coordinating with our sources in China to get quotes ASAP. Ted is polishing the controller some more, after 3D printing a sample. He rescaled the controller size up just a bit to make it more comfortable. That should also give us a little more room for instructions in the overlays. This looks really good (and it seems designed for custom overlays, which is good too) but the squared bottom corners of the controller leave me pondering. It seems like those square corners are going to dig into the palms of the player's hands if he/she uses the controller for an extended period of time. It's an issue that won't become apparent if you try the controller for only a couple of minutes. You aren’t the first person to point that out, so let’s wait for the sample and do some testing. I can let you hold this thing for an extended period of time and we will see how your hands react. Glad you volunteered. Seriously, I must admit that I've been waiting for a controller like this for a long time. I just hope the thumbstick is of the heavy-duty kind. By the way, if you really want to recoup your investment and even turn up a profit, just do a USB variant. 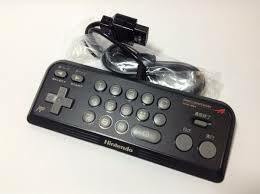 Plenty of people will want to use a controller like this with various emulators on their PCs. Awesome, glad you are also volunteering to run your thumb against the thumbstick over an extended period of time to see which one wears out first! In all seriousness, this would actually be a valid test to perform. I have somewhat large hands and the position of the thumbstick relative to the perimeter of the controller should be evaluated for comfort. A thumbstick is not moved quite the same way as a D-Pad, like on stock NES controllers. That is an interesting proposition that my retro oriented mind hadn’t thought about. We will see, but I would rather not do that though. I see what you mean, but on the other hand maybe we should keep this exclusive to this community. I mean, the PC emulator crowd has plenty of options to choose from, we don’t. As long as I don’t loose money, that is good enough. Not an April Fool's Day joke, right? EDIT: Not to armchair engineer here but is there a chance of a model using all 4 of the face buttons like a super action controller? I agree. We should test comfort before even committing to any tooling. And in all seriousness I am glad that you and your somewhat large hands volunteered. Once we have sample(s) I should send them to as many people as I can. Large hands, small hands (Trump? ), medium hands. Let people hold it, get some feedback. I should have those samples in a couple of weeks. I don't recall ever seeing a USB controller with a 3-by-4-keys keypad like this one. It would be mostly a question of using the same controller casing, buttons and thumbstick. Only the internal PCB and the cable would change. To clearly distinguish the models, you could produce controller casings in different colors. Just an idea. Is the thumbstick analog, by the way? If so, you just came up with a very interesting substitute for the Atari 5200 controller. It should also be tested on the CollectorVision Phoenix, while we're at it. We have been discussing if we should go with the SAC button scheme or a new scheme. Problem with SAC scheme is that it maps the two extra buttons to the keypad matrix, and that is bad. You can’t press both buttons at the same time or they will register as some key in the keypad. You can’t also use them in combination with the keypad. Bad design. There is an easy way to make them completely independent, and then homebrews can take advantage of them in a more meaningful way. No, the thumbstick is digital. We are just trying to do something different, that isn’t too Nintendoish, with a D-pad. I put together a rough prototype for the thumbstick using a NES pad, and it seems to control pretty well, not to mention it reduces thumb rubbing quite a bit (increasing the pad axis reduces the need for moving your thumb over the pad constantly). But again, we need the samples to properly evaluate. Hey, if you need another pair of hands to test, I'm you're guy! Seriously though, if you need anyone to beta test one when you get around to it, let me know. If I can play games with them, a lot of other people should be able to as well. The main reason I can't use the Coleco controllers anymore is my CTS (carpal tunnel syndrome) starts to act up after holding the controller for a few minutes, so I had to switch to the 7800 pad. Its the size, shape and orientation of the fire buttons on the Coleco controller that contribute to aggravating the condition.